Yesterday was "Hello Thursday" - the day when Provo Craft announces the newest Cricut cartridges. Five new cartridges were announced - four of them are already available at ACMoore stores. To see the full cartridge handbooks for each cartridge just click on the name of the cartridge below to go to the proper page from the cartridge library under the information tab on the Cricut site. Here is a LINK to the cartridge library page - if you haven't seen this valuable resource you should take a look. You can find single page previews of each cartridge and the full digital handbook as well. You can see some information about Toy Story in the shopping section of the Cricut.com site (the handbook is not yet available in the Cartridge Library). Two more cartridges were listed as retiring - All Mixed Up and Christmas Cheer. If you are interested in either of these and don't have it yet you should try to get it soon. More Cuttlebug Companion folders to go with the four new cartridges were announced. You can see them in the shopping section of the Cricut.com site - here is a LINK to the page for all of the Cuttlebug Companions. 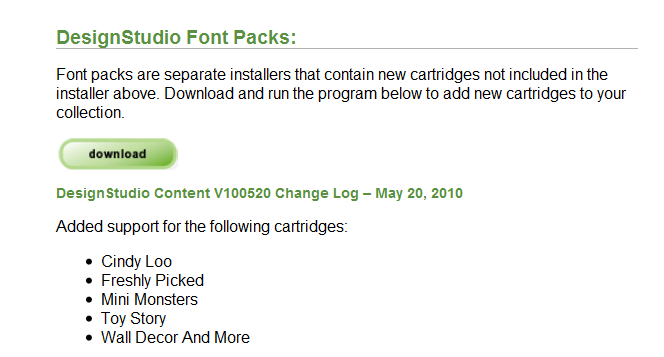 You can add all five cartridges to the Design Studio program by downloading the font pack update HERE. 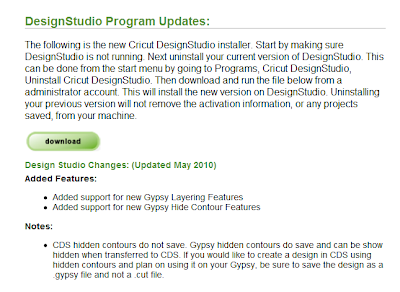 You will need to log in to the Cricut.com site to do the download. When you download the update you should save it and then run it to be sure that the new fonts will be properly installed. There is also a Program Update available at the same link. I tried the program update on my new desktop and found that there are some issues. I would recommend waiting until these are cleared up before installing the update. There are some reported issues from people who say they have had their older files corrupted by the new update. I did try opening a few older files and did not have a problem. It does appear that work is being done towards the grouping feature. You can click and drag to create a box around two objects or sets of objects in separate selection boxes. Then you can move them around the mat together. When you try to enlarge the items, they will enlarge together but their relative positions will not stay the same. This new feature also does not keep a flipped item flipped and you can't copy and paste the selected object as a unit. I did not try doing any cuts with the new update after I discovered these problems - I'd rather wait to be sure things are working properly (and my desktop is two floors away from the Cricut!). I did spend some time looking at the new cartridges and each one has features that interest me - so the wish list is growing. There are some empty spots and repetition of images (such as the blackout of the frames and seed packs on Freshly Picked). While I would prefer to have cartridges with no keys left empty and no images repeated, I understand that the cartridges are designed with the user who is working directly from the cartridge in mind. Keeping the blackout image on each key does simplify using the cartridge. Thanks for the great update! I am excited about the same cartridges. I wonder if they are at Michaels yet? Too bad I did not read this before updating. I have not yet try to open DS, but will try tomorrow. My favorite is Cindy Lou and I immediately noticed before yesterday that this cartridges do have repeated images and I do not much appreciate that, but.... I am waiting for Toy Story which I know I will love. I love Disney stuff!! I've done the program update. 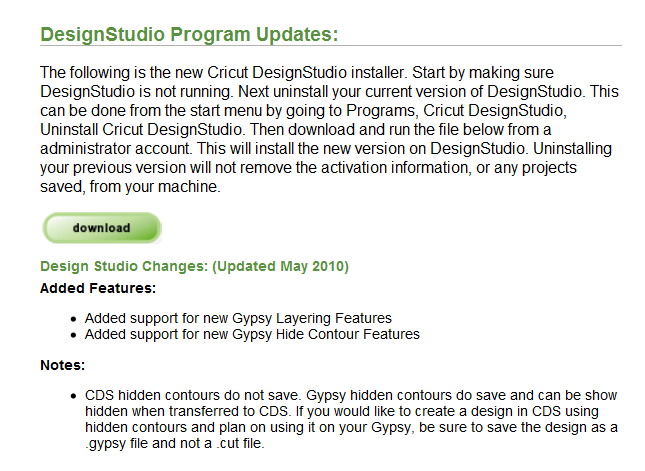 So far I'm not having trouble only because I don't have a gypsy. I've opened files that were sent to me and had no trouble with them. My oldest files are only a few months old so I can't use mine as a test on that issue. I'll hope that they make the fixes soon but I'm excited enough about the move toward grouping to keep the new program update. I also have finally fixed my keyword search. It was driving me crazy. I have half a mind to go back and redo all of them. It seems that there is no uniformity in who put the keywords into the program. some are capitalized, some aren't. Some are plural, some are not. Now I'm going to try and figure out if I can work out putting my own keywords in. For some reason it never seems to save when I put them in. As for the new carts, I think you have chosen my favorite two. Thanks for the update. I'm still trying to figure out which cartridge has the nativity/baby Jesus. I saw it in the multi-image advertisement banner, but can't find it now! Thanks for the tip about the CDS update too. As I don't have any of the new cartridges, I'll wait to download. I love the same 2 you picked. Excited for wall decor and more. Not updated yet. I hope they can fix them soon. Thank you so much for all you do. I like Freshly Picked and I would love the Monster one when scrapping my grandchildren's Halloween pictures! That will be really cute. I love the monsters. also toy story, i like the freshly picked, but not sure if i will get it. I love your site. I learn so much form you. Thank you for that. My favorite are Mini Monsters and Wall decor. I'm a halloween person and can see great possibilities for these. Thanks for always having the BEST information ... like "wait for the fix" before updating DS ... sure would hate to mess up stuff I've worked hard to create! I must have Cindy Loo and Wall Decor...love them. Thank you! I LOVE all your instructions. You make everything so easy. I am going to go download my updates right away! Cindy Lou is my top favourite. But I must say I am tempted with the Wall Decor & More but I am confused by the card cut as the images go from the crease which would make the images upside down or on their sides. Am I missing something. I am a bit puzzled by the card cut as well. I think that these could be used for place cards or to make a pop up card but I haven't seen the cuts finished so I am not sure if it works that way. I would like to get my hands on this one soon to give that a try!